What Does A Kid Need To Learn? What does a kid need to learn these days? If you believe as I do that access to the Internet is a fundamental requirement for learning and living in the 21st Century, then the next question to ask is what is the best device to achieve that? It’s a question I hear asked often. Everyone seems to want a simple answer. Buy this device, it’s common core ready. Or buy this device, it’s SBAC ready. Or buy this device because it’s the IT department’s standard and it can be “managed” and supported the way we’ve always done it. Well, I suppose there are some factors that need to be considered but my requirements for a 1:1 device for all students are fairly basic. I did agree to hand out iPads to High School students, after all. I believe a student’s everyday device should do three things really well. I’m leaning on my everyday device (iPhone) use for guidance here. First, the device’s battery has to last under heavy use through the entire school day. If the device has to be charged in the middle of the day, that presents all kinds of access issues. Ideally, the device would last a day and a half, given that some kids might forget to charge over night. Not that I have ever forgotten to charge my iPhone. Second, a student device has to be cheap and relatively durable. These devices will see a lot of wear and tear. Some will be stolen, some will be broken. It’s possible to wrap devices in protective cases to achieve durability, but it would be nice if they were semi-decent out of box. And last but not least, the device has to perform. It needs decent specs, good speed, a responsive touch screen or trackpad and it has to have wireless 5GHz connectivity because it needs to get kids onto the Internet in high density environments. What does cheap mean to me? Well, as someone who works for a public school, it means sub $300 per device. This knocks out quite a few devices right away and leaves us with basically Chromebooks, 11.6″ Notebooks, iPad minis (if we close one eye and squint past $29) and 7″ Android tablets. 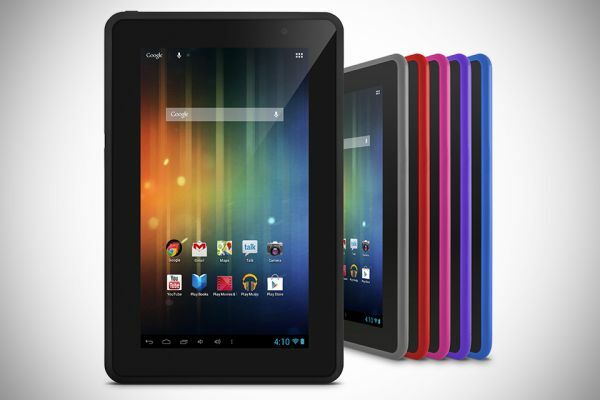 Of the four, the 7″ Android tablet, specifically the Nexus 7, pretty much beats all the rest on price and handily meets the other two requirements. So why isn’t every school in CA buying these low cost Internet connected devices for students? Well, I think the main reason is because our new next generation 21st Century tests won’t work on a 7″ screen. A light weight, inexpensive device that can access the world’s knowledge yet we can’t give one to every student because the “new” online tests were written for desktops? Desktops are done. It’s Ridiculous. But lets pursue the 7″ tablet idea further and pretend that perhaps we still can provide every student a low cost tablet (I really wish google made a $150 wifi only Nexus 4) while living in a utopian world where we might buy carts of Chromebooks for our testing labs to meet the requirements of the folks in Sacramento. What might students be able to do on a daily basis with a device that has no physical keyboard and only a 7″ screen? Well quite a lot if my wife’s computing experience over the past year is any indication of how the world has changed. Everything that she used to do on her Laptop she now does on her iPhone, including reading, shopping, bill paying, registering the kids for activities. Everything. Up until I got Printopia setup, the only reason she ever had to use the Laptop anymore was to print. And now that’s no longer an issue. Granted, she’s not writing 5 page essays anymore. But she’s posting on Facebook, communicating daily with her friends and family via iMessage and recording pictures and videos of the kids. She’s creating content as well as accessing it just fine on that dinky 4″ iPhone 5 screen. I think a small, light weight, affordable, portable device is the perfect way to go in education. It would get every kid connected, affordably and immediately. If not for the silly tests and their 10″ screen size and physical keyboard requirements. So back to reality, if it weren’t for SBAC, I think I’d be advocating for 1:1 tablets for kids (7″ Androids for cost, unless Apple gets on the ball with the iPad mini pricing next week) with a few Chromebooks in every classroom and a few Chromebook carts in every Library. Google Apps for Education (GAFE) would be the bridge between the devices and students would have access to their content on any device, anywhere and anytime. But SBAC is here and providing an equitable testing solution for all students is going to be a real challenge for many schools. The hodge podge of devices currently found in my district’s schools provide neither ubiquitous Internet access for students nor a robust and standardized testing platform. We really need to move to a 1:1 device scenario and when we do, the solution will be more costly and a bit stuck in the past all so that we can support a test platform that was built in the early days of the Internet. The world is quickly moving towards mobile and just as the Education community begins to realize the importance of preparing kids for their futures using the same technology rich experiences they are used to using outside the classroom, we should be very conscious of the incredibly rapid pace of change happening in that world right now. Mobile is the future. Tablets are the future. Are we testing kids for their future? Not without mobile and touch we’re not.